We Drink Your Milkshake! 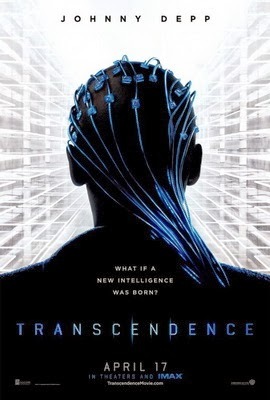 : TRANSCENDENCE Trailer Drops! It pays to be friends with Christopher Nolan. First time director, but long time cinematographer, Wally Pfister, has an all-star cast for his first sci-fi film, TRANSCENDENCE. Whether or not he can stand on his own as a director remains to be seen. Dr. Will Caster is an artificial intelligence researcher who strives to create a machine that possesses sentience and collective intelligence. Extremists who oppose technological advancement target him, but their actions drive him toward his goal. Caster also wants to become part of the new technology, and his wife Evelyn and his best friend Max Waters, also researchers, question the wisdom of this drive. Caster's goal to acquire knowledge becomes one to acquire power, and he seems to be unstoppable. Is it me, or did this trailer just give away almost the entire film? I like the idea of exploring what would happen if the human consciousness and artificial intelligence become one. No doubt some scientist in a hole somewhere has toyed with this very idea. But, this trailer seems to be giving away WAY too much, unless there are some plot twists they're keeping secret. TRANSCENDENCE will be released April 18th, 2014, is directed by Wally Pfister, and stars Johnny Depp, Morgan Freeman, Rebecca Hall, Paul Bettany, Kate Mara, and Cillian Murphy.